Based on prior reviews, parked in dirt lot and went to get players club to get card. They knew nothing about having to check in for RV parking but took us to security office to verify. Person in charge of security called someone and came back saying there is no charge. One of them thought they tried a deal where you could earn the $5 back by putting points on your card. Security did explain no dumping, etc., and park at our risk. No problem. Buffet pretty good given it was almost closing time. Only complaint, dirt lot has sign saying RV parking to left and trucks to right, but trucks were spacing out well into RV area. 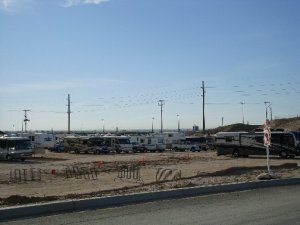 Another RVer was real unhappy with their noise (I understand why they need to run all night, but the casino tried to mitigate with separate parking areas.) It was hot (mid-September) so few RVers. I wouldn't be surprised if some kind of fee might start when snowbirds return and lot fills up.